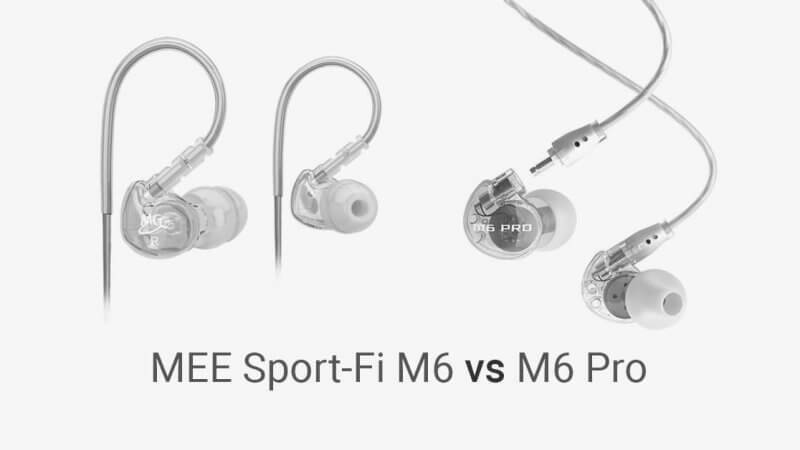 The MEE Sport-Fi M6 headphones are great low-cost headphones for in-ear monitors. I have been using and recommending them for several years now. When I ran across the M6 Pro headphones, it took me awhile to purchase because I was happy with the Sport-Fi M6s, and they are less than half the cost. I ended up purchasing the M6 Pro headphones so I could write a comparison for the Collaborate Worship community. What I found surprised me. Turns out, they really are worth the extra money, and here’s why. Improvement #1: The M6 Pro headphones fit better. One problem I always had with the Sport-Fi M6s is that they would work their way out of my ear throughout the worship set, regardless of what tips I used. This really isn’t a huge deal unless you are singing. When you sing, your ears move in conjunction with your jaw, so the headphones work their way out even faster. Keep in mind, I never had them fall out, but just lose their seal. When the seal is lost, you can still hear, you just don’t get the full sound anymore. The M6 Pro headphones fixed this problem. I still have to adjust them occasionally throughout the set, but they stay in my ear much better than the Sport-Fi M6 headphones. Improvement #2: The M6 Pro headphones sound better. Both the Sport-Fi M6 and M6 Pro headphones have a crisp, clean sound with plenty of low end. But, I have found that the M6 Pro headphones have a better mid-frequency response. They sound warmer and more balanced overall. So, which headphones should you get? They are both great headphones. It all depends on the use as to which you should get. Here are my recommendations. The M6 Pro headphones tend to stay in your ears better, which is absolutely necessary for vocalists. When you sing, your ears move in conjunction with your jaw, so you need headphones that stay put. Unless you are extremely picky about the sound quality of your headphones, the Sport-Fi M6 headphones will work great for musicians that are not singing. The M6 Pro headphones do have a better, warmer sound, but only a keen ear will appreciate the difference. If you have the extra cash, give the M6 Pro headphones a shot. If you are willing to dish out the extra money, you will not be disappointed with the M6 Pro headphones. However, I recommend getting a pair or two of the Sport-Fi M6s for backup in case you forget or lose your M6 Pros. I have used the M6 Pro for over a year and half now and love it. One added feature is that it does come with an extra cable, so you really get to double the use if one cable breaks as mine did. So the value even though twice the price of the MEE Sport you actually can get twice the durability if a cable breaks. Best Value and I highly recommend the M6 Pro. All of our musicians and singers use the M6 Pros and we all love them. They are durable and sound great. Definitely worth the money and won’t break the bank. Thanks! I had been going back and forth about whether or not to buy a few pairs for my team and this helped. 🙂 I look forward to trying them. Thanks for doing the homework and sharing your results. I hope to go to IEMs within the next 6-9 months. This info is a huge help! Both models are not for bass player as we tried. There’s some kind of vibration or build-up of sound which is kinda irritating. Can you please share your experience? Maybe we made a mistake in using it. Thanks! It is tough to find headphones that the bass player appreciates. Both of the MEE headphones have good low end, but can definitely get overloaded when the bass player turns the bass up as loud as they would like it – which is where the ‘build-up of sound’ you talk about comes from. I wish I had a good, low-cost recommendation that would make bass players 100% happy, but just haven’t found them yet. In the meantime, my bass players uses the MEE Sport-Fi M6s with a small bass amp behind him to help ‘feel’ the bass. Thanks Kade for making the honest opinion and your experience. And agree with you, as our bass player also uses the M6 sport with an amp behind him but totally reduces the volume from each amps. Please just let me know once you tried something else that would improve this for bass players. Continually trying to find some solution and recently improved the situation for our bass player. It was just a routing improvement. Before, I plugged the bass guitar output to a Fender amp input then amp balance output to the personal monitor device. Changed it to bass guitar>active DI>output link to fender amp for stage sound>DI out to personal monitor. I got clean sound already. Thus, the amp output overloaded the personal monitor device that causes the distortion of the M6. Thanks for the update, Earnest! Thanks Kade for this comparison …it came as a blessing!